Well, I've got 3 All Grain batches under my belt so far. All of those were recipes I found and scaled to my system. There were maybe 1 or 2 things I added or did differently, but for the most part I stuck with the original idea. I've been doing some research on ESB's. I'm shooting for something that's malt forward, nice mouth feel, depth of flavor. I thought I'd post the recipe to get some feedback from more experienced brewers. I brew 5 Gallon batches. Try 8-12% eng med Crystal and Maris Otter. 25% caramel malts plus brown sugar is counteractive and likely going to be muddled. Simpler is better. 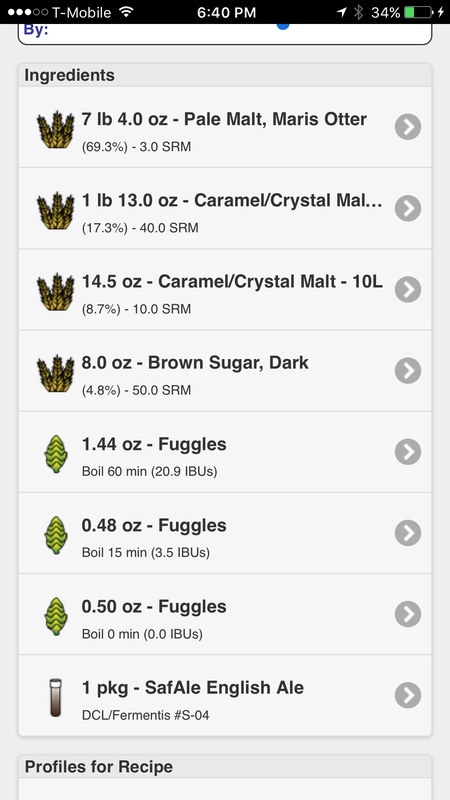 Hop schedule looks ok.
Should I keep the brown sugar or ditch it? Personally, I would ditch the brown sugar. Sounds like blatz concurs. I've never seen that in an ESB recipe. My first impression is too much crystal, and I agree that the sugar and crystal are counter productive. hop schedule looks good. When making my ESB I try to stick to the following ratio more or less. 88% base, 10% crystal/adjunct, 2% color/dark malt. remember cystal malt adds color but also a lot of flavor, and it can be used sparingly. if you are adding mid/dark crystal for color you can always use less and add a touch of dark malt for color. sugar on the other hand (even brown sugar) does the opposite. it will ferment out almost completely and is usually used to dry out a beer (lighten the body, while maintaining alcohol content). I find the bottled version of Fullers ESB we get in the US to be too sweet compared to the cask version in the UK. The bottled version is stronger in ABV, and is a different recipe. John Keeling of Fullers was interviewed on a Can You Brew It episode on the Brewing Network, and his recipe was only 5-6% Crystal malt. No sugar either. I think so too, although the draft (beer engine) I've had were stateside and I'm sure its not the same. I looked and my ESB is 92.5% MO/7.5% English dark Crystal 70-80L, as a data point of reference. I concur with the grain adjustments from above and would also state that you will probably want more IBU's in your finished product to balance out the crystal malt. Maybe consider shooting for 35-45 IBU's depending on your preference? Really great information here! Thank you for the advice. I'm with that suggestion for what I like in an ESB, worth noting that (1) 2008 BJCP caps the style at 35 IBUs and (2) I thought it was interesting that the OP was going for a malt-forward ESB. +1. My first thought: Need more hops! Bittering especially. Aim for at least 32 IBUs if not 35-38. I'd also use 1/3 as much crystal malts, consider 1/2 as much brown sugar or zero. 2015 guidelines go up to 50 IBU for strong bitter. 35 IBU is good for Fullers ESB (only ESB in the UK,as that is trademarked), which is a malt showcase. I'd actually say the brown sugar is an interesting idea. I've got a British homebrewing book that suggests simply using table sugar if invert is unavailable. Since invert is blended with molasses to approximate the darker invert versions, I see brown sugar (table sugar + molasses) being an interesting idea. I usually use about 10% invert, sometimes more in my bitters. I agree with others though, more hops and less caramel malt. If the sugar seems to thin the beer out too much without all that caramel malt, decrease the carbonation, it'll help make is seem "thicker".